Repose is a solo exhibition of new work by Yann Novak that explores how context changes perception. Repose consists of an audiovisual installation and series of seven chromatic prints. 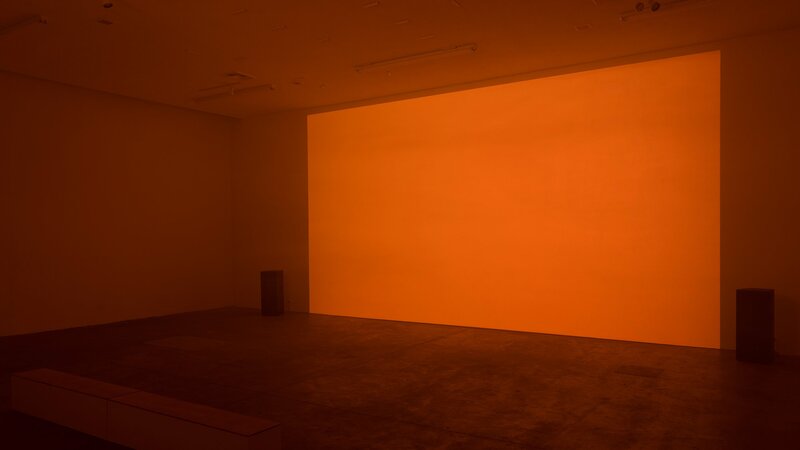 The installation presents a monolithic sound piece, comprised of purely synthetic timbres devoid of traditional compositional elements, accompanied by a projected field of light that continually shifts in color, hue, and saturation. The series of prints, titled Repose.Heptaptych, is fabricated on acoustic absorption panels and installed in the gallery foyer. Each print represents one of the seven fundamental colors in the installation. The acoustic properties of the material serve to dampen the ambient sound outside the gallery as the audience enters the more sonically excited environment of the installation. The first iteration of this project began as a performance commissioned for the 2014 AxS Festival and was performed in Cocky Eek’s inflatable SPHÆRÆ. The performance was an examination of the inseparability of sound from context, and its effects on our perception of time, space and subjectivity. In that piece, Novak proposed that our experience of sound is highly dependent upon the listening environment, and that the modernist notion of “reduced listening” introduced and championed by Pierre Schaeffer is problematic as our ability to understand and decode sound is always produced as a negotiation between phenomenon and context. For the listener, there is never an opportunity to decouple the phenomenon of listening from the personal, structural, and political context within which the sonic field exists. The exhibition’s closing will present performances by Rebecca Bruno, Sarah Rara, and Geneva Skeen. Rebecca Bruno will offer a choreographic response to Novak’s Repose.Heptaptych. A gestural run-on sentence performed in four orientations meditating on the relationship between movement, subjectivity, and repetition. Sarah Rara will present Separating the Air, a new performance which involves games of listening and learning between voice and computer at the boundary between music and speech. Each part is a device to punctuate silence, divide time, move the air. Geneva Skeen will present Pop Song, a temporal response to Novak’s drone work, and a cultural response to our times. In harmonizing with Novak’s loop – divided into 3-4 minute segments (the average acceptable length of a pop song) – Skeen’s Pop Song acknowledges that populist times call for populist measures, but refuses populist comfort, acceptance, and pale standards of beauty as means of resistance.